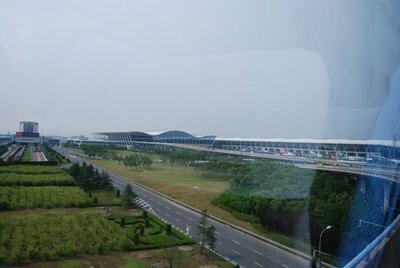 Our adventure ended today, and we were efficiently transferred to the Shanghai airport - one of the most modern and efficient that I have been in. The plane flights home were on time and I was back in Charleston on time in the early evening. A bonus - my bag was the first one off the baggage claim. 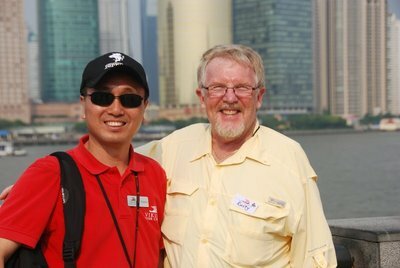 What really made this trip special was the care and attention of our Tour Guide Francis Ying - professional and courteous in every sense of the word, he made this trip flawless. The was the consensus of our entire 34 person group. We couldn't thank him enough. Now to processing more than 500 photos, which I will have up on the web in an album for viewing - stay tuned. Next up - Ireland in late August! Chinese national anthem, which he did quite well. 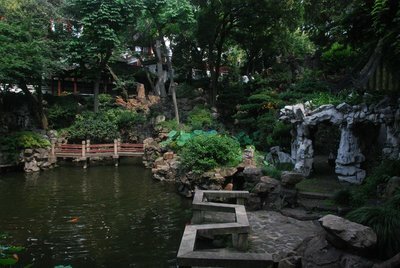 After walking quickly through old Shanghai, we entered the Yuyuan Garden. It was quite elegant. We then had about 45 minutes to wander in sweltering South Carolina like heat around the 400 year old renovated buildings with a definite Coney Island type atmosphere. 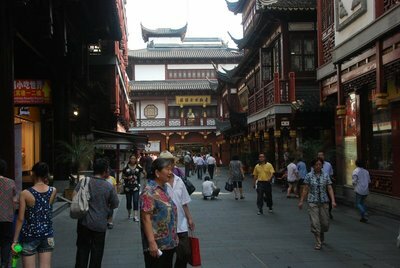 The lower floors were converted to small and larger shops that most of which were inexpensive trinket type shops and fast food interspersed with some higher end shops. 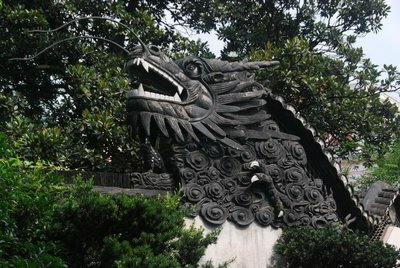 After a quiet restful and cool lunch, we headed for our final stop on the tour, the Shanghai Museum. 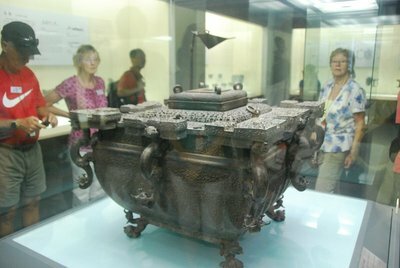 We have all been impressed with the quality of the museums that the State has built for its antiquities. As with most museums in the US, this museum had a large number of school children waiting to get in while participating in their summer camps. 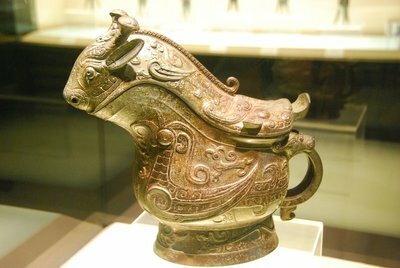 The museum houses some of China's finest antiquities. Tonight is our 'farewell dinner' away from the hotel, and an acrobat show within the hotel. 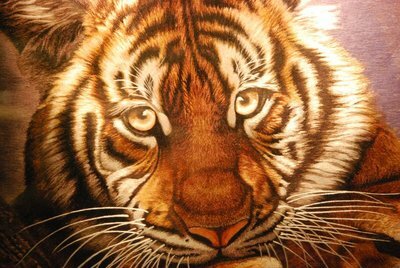 The sleep and head for the airport at 0615. 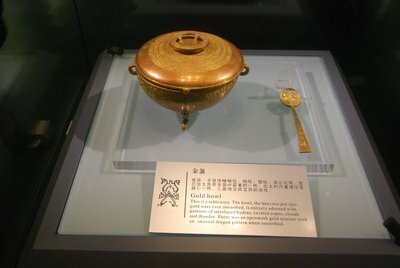 We were on the bus at 8:20am and headed for the museum housing the artifacts from the tomb Marquis Yi of Zang, an undisturbed tomb from 2400 years ago found in the 1970's by accident. 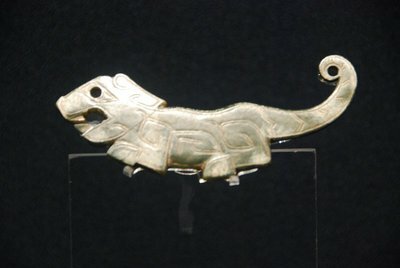 The tomb had completely filled with water, which preserved a wealth of bronze musical instruments and artifacts the likes of which had not be seen before. 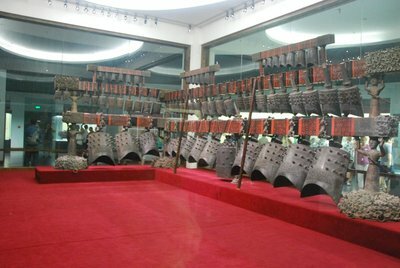 Many of the musical instruments were completely functional. It was a remarkable find, which shed great light on the Chinese artistic and musical culture of that time. It was a great treat to look at these wonderful pieces. With a box lunch in had we headed the Wuhan airport for our flight to Shanghai (about 80 minutes). The plane was really hot - although a Boeing 737, the Chinese have not invested in off plane air conditioning. The plane never really cooled down during the entire flight, though the chinese lunch that was served was surprisingly good! 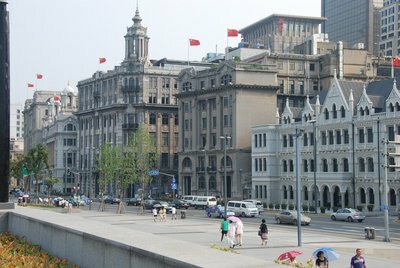 We then headed to the old trading part of Shanghai - the Bund - where you can see both sides of Shanghai - the old and the new - on each side of the river. 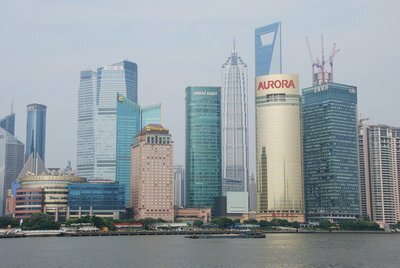 Then on to the hotel the Portman Ritz Carlton Shanghai - a wonderful property - Thanks Viking! Dinner on our own, rest and relaxation! Our highlight today was the visit to one of three rural elementary schools that Viking sponsors. 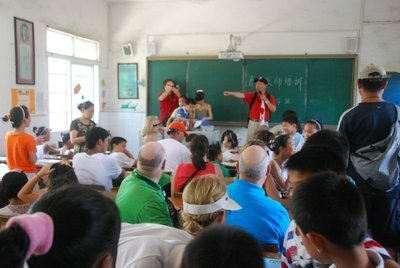 Their initial investment in this school was 1 million Yuan. This was the last day of school, so the kids were riled up and ready to go home. The greeted us with a drum band, did a stage performance for us, and then we joined them in their classroom, where they sang for us and we sang some kids songs for them. It was an exciting morning. 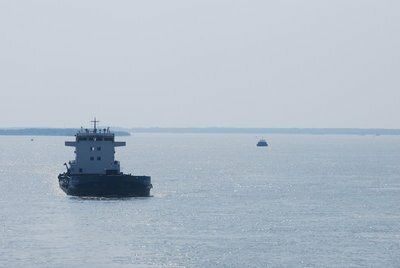 As we had quite a distance to sail to get to Wuhan, we set sail as soon as we got on board. 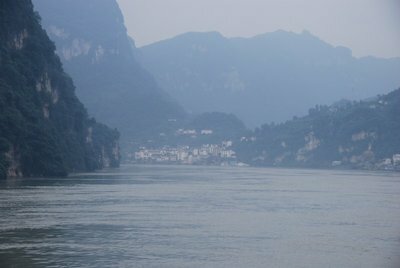 The Yangtze below the gorges flattens out to a broad country river, although still with quite a current. 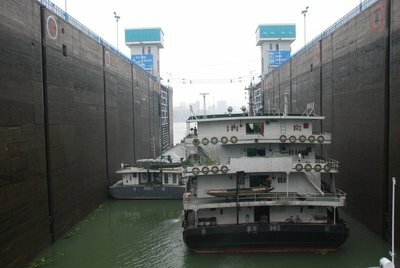 Today the tour was to the Three Gorges Dam. We decided not to go because it was foggy - very typical for the gorges region, they don't get much sun during much of the year - and because all you really do is look out over the dam and the lake. They don't let you in the dam like they do at the Hoover Dam in Las Vegas. The dam is 2000 meters long (6556 feet) and costs about $21.8B to build. 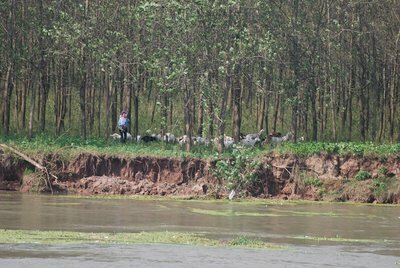 It raised the water level in the Yangtze and it tributaries by up to 100 meters. It generates 18,200 megawatts of power. 326 towns and 19 cities were affected by the dam requiring 1.13 million people to be relocated. Many chose to relocate to the cities, rather than into the new housing that was built to accommodate those that were affected. The resulting reservoir is 326 miles long.